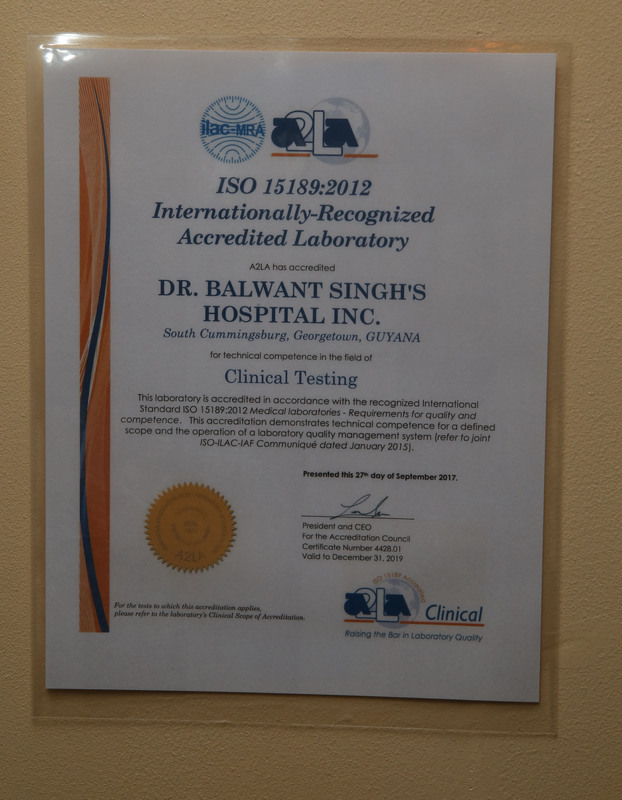 The laboratories of the Dr. Balwant Singh’s Hospital Inc. have received a boost by becoming the first in Guyana and South America to receive the ISO 15189:2012 accreditation from the American Association of Laboratory Accreditation (A2LA). Essentially, the accreditation of the hospital’s laboratories reinforces the confidence and validity of the lab work done by the hospital to such an extent that the results will be accepted by international medical institutions. According to Chief Executive Officer (CEO) of the hospital, Dr. Madhu Singh, A2LA, is a non-profit, internationally-recognized accreditation body in the United States that offers a full range of comprehensive laboratory and laboratory-related accreditation services and training. She further noted that with the accreditation, the laboratories of the Dr. Balwant Singh’s Hospital have become the first in Guyana and South America to be accredited by the international body. “It is the first hospital laboratory in Guyana to have achieved this distinction. It has been a long journey for us, as we have flirted with ISO for three years but have worked seriously for the last two years towards this. The Bureau has given us tremendous support throughout our struggles. Both Ms. Semple and Ms. Walcott guided us technically and with generous doses of moral support when we thought we would never achieve this goal,” she said. “Dr. Balwant Singh’s Hospital is committed to quality and is also committed to offering the best prices in the Caribbean, and of course, in Guyana,” Dr. Singh added. Meanwhile, Executive Director of the Guyana National Bureau of Standards (GNBS) Candelle Walcott-Bostwick, noted that not only is the accreditation a momentous one for the hospital but should also be seen as a contribution to the development of the local health sector. “I think it is a milestone for the laboratory and for the hospital because it is the first laboratory in Guyana with an accredited lab…. An accreditation basically provides confidence in the results issued… I think this is also a contribution to the development of our health care system in Guyana and I would like to encourage the other hospitals in Guyana to get on board, to join the two medically accredited labs that we have now and it tells us that Guyana is moving. I can tell you that we are very happy and committed to working with Dr. Balwant Singh’s Hospital,” she said. “Quality is a moving target, accreditation is the first step in the new beginning for this laboratory…,” Walcott-Bostwick added. Similarly, Head of the Conformity Assessment Department of the GNBS, Rodlyn Semple emphasized the importance of accreditation, while wishing the hospital well. 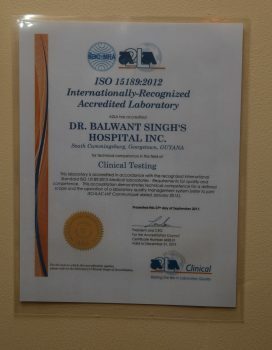 “Accreditation is crucial in the world and we know the seriousness of a medical test result and once again accreditation opens up global markets and this could possibly mean that we could have medical tourism coming here, because with accreditation and ISO 15189, it tells us that the lab is technically competent and there is confidence and assurance in the validity of the test result,” she said. “We want to congratulate the lab and encourage them to continue improvement,” Semple added.